This entertaining if nihilistic essay by Patton Oswalt seems to demonstrate that he took his brief stint on Dollhouse way, way too much to heart. It's a geek rant by an off-brand Tyler Durden, plotting to destroy otaku-consumerist society via the trash-culture Singularity. Since he used to be a fixture on those VH1 list shows he's proposing to use for his plot to goad otaku-pop into eating itself, I'm not sure whether we're supposed to take it seriously, or not. There's a clever observation in the comment section about "generational shovel envy" that probably addresses the serious concerns inside Oswalt's comedy. Otherwise, I'd note that if the otakuficiation of mundanity offends you, you either need to get over your need to be a special and unique snowflake, or grow up & start working on a connection with high culture - you've obviously got too much inherent pomposity to comfortably slum about in trash culture in the long run. So I just finished watching Corpse Princess, or Shikabane Hime if you don't like the English title. It was the horror-moe Gainax show from a few years back, one of a number of shows in that period featuring dead girls killing monsters & providing male-oriented fanservice. I took a disliking to the show when I saw the first episode in fansubs, but went back this fall when the FUNimation half-season sets hit the semi-discount bins. Most of the things I didn't like the first time were still there in the whole, two-cour, 26-episode series, plus a few more irritations which I'll get into later. But the whole ended up more engaging and likable than I first gave it credit for. They did themselves a real disservice by opening up the series with a charismatic-polygamist hipster-villain as the first "monster of the week". It gave the show the apparent character of extreme misogyny, which it didn't really deserve, I guess. Now, mind you, there's a lot of female villains, especially monstrous mother-figures. Since the whole show is about murderous, unnatural corpses and the virgin-sacrifice animate corpses who kill them, it's a little hard to avoid that sort of thing, but it definitely is a consistent undertone - not an overt, constant presence. The story is about a Japanese esoteric Buddhist sect which is built around "handling the dead", which is, after all, one of the major functions of the real-world Buddhist faith in Japan. Traditionally, one is "born Shinto, married Christian, and die Buddhist". This came about because of the extreme revulsion and doctrinal incapacity of Shinto when it comes to death. The fundamental corruption and defilement of the dead is a core concept in "classic" Shinto, and the various folk-religion clusters which make up Shinto break down heavily in the face of the corruption of the dead. Basically, because Shinto was a religion which emphasizes purity over morality and sanctity, death and death-rites became by default the preserve of the imported Buddhist traditions which didn't really care about purity. But here in the real world, that "handling" is a ritual and practical thing, not the fantasy-world extermination of the revenant dead which this show plays around with. Corpse Princess is nominally a Buddhist show, in that most of the characters are members or chattel of a rather hide-bound (made-up!) Buddhist sect, and the scripts are full of Buddhist terminology and (extremely twisted) Buddhist doctrine and ideology. The heart of the story is more Shinto than Buddhist, anyways, like a doctrinal skin of Buddhist cant over the decaying, rotting Shinto meat and bones. The characters talk Buddhist but act Shinto. There are a lot of furious ranting about defilement, which is a pretty non-Buddhist concept as I understand the faith. As the show wears on, it's increasingly obvious that the Buddhist cant is, indeed, Marxist-definition ideology - intellectual super-structure constructed to justify necessary practices within an existing cultural tradition. The man who created the "Shikabane Hime" system existed within a culture and a period where radically esoteric Buddhist ideas were the "new wave", history-on-the-march. He built his demonic-corpse-combating system from the materials he had at hand - the "fact" of violent, sentient revenants, and the faith and doctrines which he felt to be true. "An institution is the lengthened shadow of one man" - no doubt, if he had been a Soviet commissar, the Shikabane Hime system would have been built on tenuous palaver about the dictatorship of the mortal proletariat and the immaterial dialectic. The animation was a shared production between the renowned (if problematic) Gainax, and some company I've never really noticed all the much before, feel. (That's the name, feel. Lower-case pretentious.) I seem to remember hearing before that Gainax did the first cour of 13 episodes - "Aka", and feel did the last cour, "Kuro". The two seasons don't really "look" different, and I'm guessing that the creative staff carried over for the whole production, and the division of labor was more of a management, production thing. The scripts waver between absolutely vicious, sharp material, and soppy, long-winded wittering on about feelings. It verges on schizophrenia, but when it's on, it's on. Art slops around a bit at times, but visually, the worst sins are there at the beginning in the first episode - the fight-designs are too hyper and unfocused. There's a lot of swirling about & incoherent action. 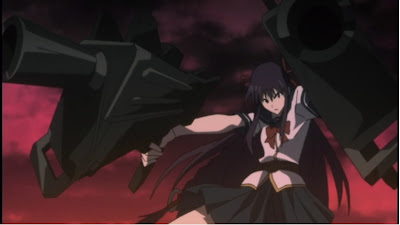 They chose to give the heroine a pair of sacrilized sub-machine guns (a gun otaku would have to tell you what they were, I'd class them as sort of "mini-Uzi" deals, but I'm not detail-fixated enough to go track down what they were supposed to be). This might have looked "cool" in the character-design stage, but what it does in animation is weaken impact and soften the fight scenes. "More dakka" may be a game-fanboy cliche that some people love, but in a supernatural monster-fighting show, SMG fire has all the dramatic impact of turning a garden-hose on a rabid dog. It just drops into the red-black swirl of the action, and ends up looking ineffective. It's the supernatural Buddhist-monster-hunter equivalent of sending in the tank battalions and fighter-bomber squadrons in a Godzilla movie, or dropping a nuke on an Angel in Evangelion. Finally, not to be a spoiler, but the ending of the series is abrupt, incoherent, and disjointed. Second-to-last episode, we close out on heroine beating in the face of the Big Bad. Last episode? Flashback episode about two dead, secondary characters' origin stories. Total non sequitur. Don't get me wrong, as a standalone, that last episode was great, fired on all cylinders, did what it was written to do. It's just that this was *not* the place in the series for this particular show. It *should* have been placed fifteen episodes earlier. I don't know if it was actually a mis-labeled OAV pitchforked into the disc-set as "episode 26", but nothing in the presentation suggested it. The second-to-last episode declared "to be continued", which definitely suggests that *somebody* intended there to be a real episode 26. Oh, well. It's worth watching, but it's not deathless art, or even particularly great. Yeah, we're about due for the rapture. Pat Robertson has gotten to my left on drug legalization. I just got a comment on a very old post asking what I thought of WikiLeaks & then chiding me for being inactive. When even the spambots think you've been too quiet, you've been too quiet. I'll try and come up with something later today... meanwhile, I think that Assange was born to hang, but he probably shouldn't be prosecuted. Just quietly abducted, shot, and buried in a saltmine somewhere. Wow, it's official. Keith Olbermann is the second coming of Father Charles Coughlin, the ravening socialist-progressive for whom FDR's less-than-absolute dedication to nationalization, socialization, and blood-on-the-walls class warfare was a stinging betrayal. Imbeciles who claim an equivalence between Coughlin and Glenn Beck or Rush Limbaugh are apparently ignorant of Coughlin's original stance as one of FDR's most fervent supporters during the 1932 campaign and the early days of his first term in office. It was only after FDR failed to descend upon Wall Street, burning sword in hand, to scour the money-changers from the temple, that Coughlin turned on the second Roosevelt, foaming like a rabid beast. These two connect-the-dots posts on Warren Buffett and his long-standing "altruistic" embrace of estate taxes are kind of devastating. Unless you have an ad hominem hostility to ideologically-oriented big-think blogs like the American Thinker and Human Events, I suppose. Now that I look at it, te American Thinker post is more of an ideological exclamation point, whereas the Human Events post is the meat of the matter. Short form? The estate tax is the threat, Buffett's insurance company combine is the protection racket, and his distress-sale merger arm is a modified busting-out operation capitalizing on the chaos caused by the interaction of the first two scams. My one concern with the Human Events post is the possibility that the forced-charity case may be weakened by a variation on Friedman's permanent income hypothesis - that the projected return of the estate tax means that charity strategies are largely unaffected because their purpose is long-term, and in the long term, the estate planners expect a return of the conditions which drive forced charity. First snow of the season, just enough stuck to create ice patches here and there. Creeks are high, yesterday there was some flooding in some places. I'd say that winter is here. Relatively mild so far, hopefully all of our miserable has been rationed out to the mountain-west, greater Midwest, and England this year. An update from Michael Yon, relaying an email response by Defense Sec'y Gates to the WikiLeaks diplomatic cable eruption. It pretty much says what needs to be said on the subject, barring any serious bombshells hidden deep under the manure pile. The WikiLeaks people still need to hang, though. Not because they're "terrorists" - thank you, Rep. King, for reminding people of how damn foolish congressmen can be - but because they're spies. We don't hang spies as much as we used to do - but we ought to. Incentives matter, and the prospect of hanging concentrates the mind wonderfully.